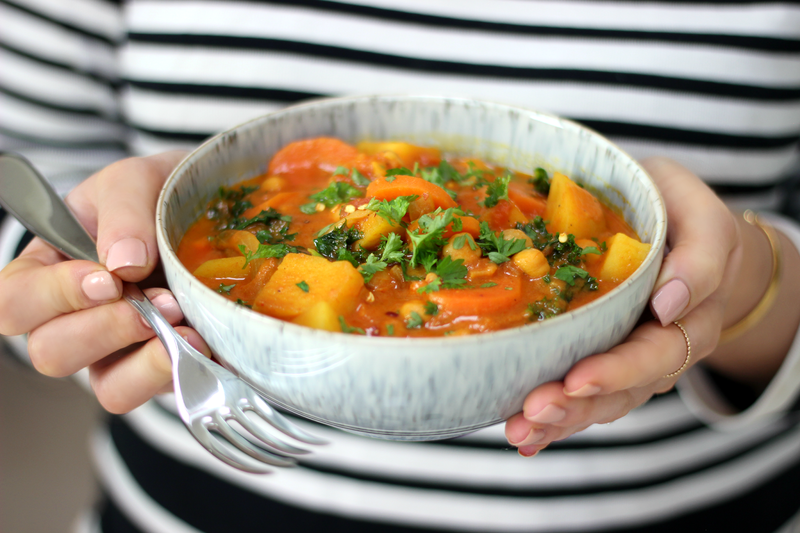 Come lunch time in the winter months, I'm craving a big bowl of comfort and nothing says that like a few of my favourite ingredients put together; chickpeas, potatoes and kale, all of which leave me feeling warm and cozy, and my belly full. Packed with flavour in a creamy, spiced coconut milk and tomato broth, I enjoy a generous serving simply as is but it also works great with a side of fluffy quinoa or on a bed of brown rice. First slice up the onion, then add the coconut oil to a pan and add the onion in with it. Fry that off for around 5 minutes, then mince the garlic and add that in too. Fry that off for a few more minutes before then adding in the chilli flakes, cumin, coriander, paprika and turmeric and cayenne pepper. Mix it well and fry it off for a minute before then adding in the tomato puree and give it another good stir. Peel the carrots and slice them up, then peel and chop the potatoes into cubes. Add those into the pan next, coat them well in the spices then add in the chickpeas, chopped tomatoes and coconut milk. Season it well with salt and black pepper, give it a good stir together, then turn up the heat and continue to sir it until it comes to a boil. Turn the heat back down, place the lid on and leave it to simmer for 25 minutes. After 25 minutes, chop the kale and add that in, stir it well and allow it to wilt, then serve immediately with chopped coriander on top. Refrigerate any leftovers and use within 2 days or freeze in an airtight container and use within 2 weeks for maximum freshness.